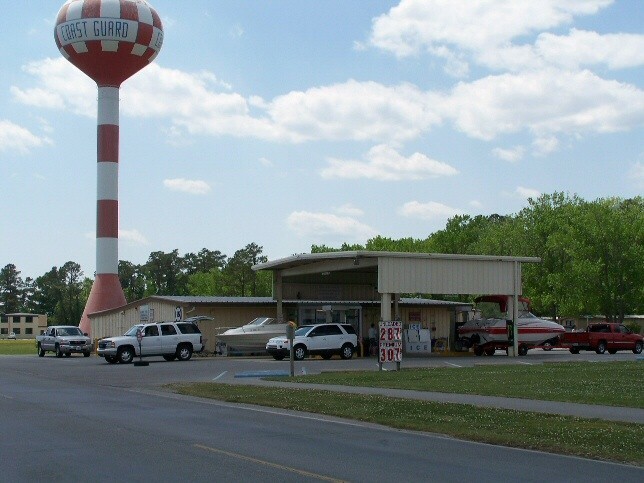 From US 17 in Elizabeth City, NC, take NC-344 (Halstead Blvd/Weeksville Rd.) south to the main gate of the CG Support Center. Portsmouth, VA is 50 miles to the north. Active, National Guard, Reservists, Retired, 100% DAV. DoD Civilians, DoT and NASA Civilians. 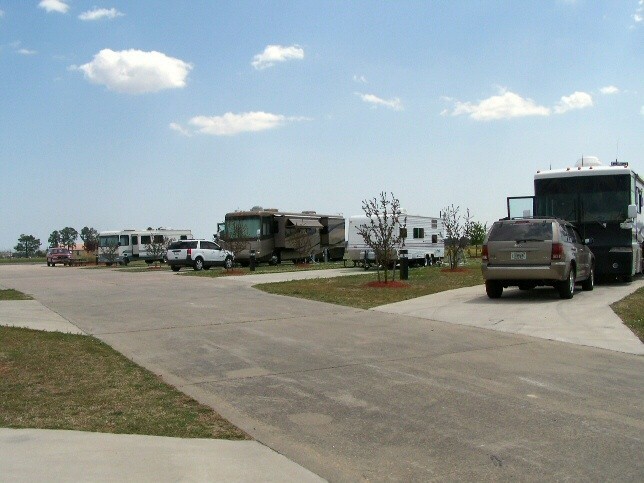 Pets allowed at RV sites but not allowed in rental cabins or mobile homes. 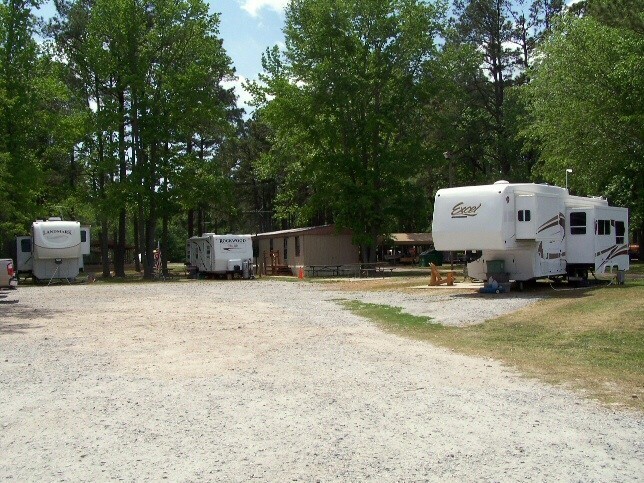 Maximum stay is 30 days in RV, Cabin or Trailer (can be extended with permission from the CO). 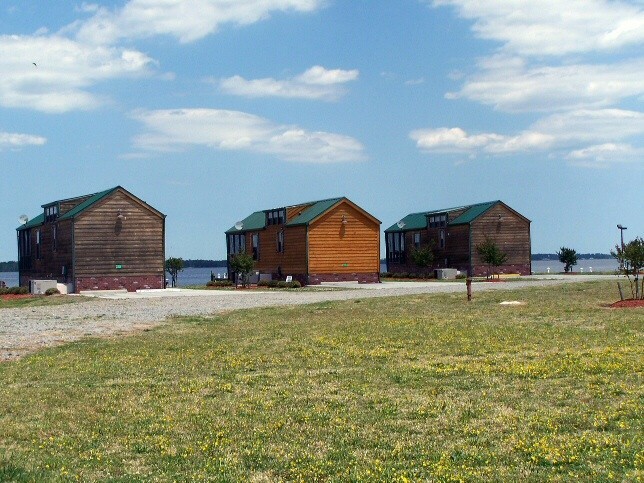 RV Park showers are closed October - April. Retired military are allowed to utilize the dining facilities. 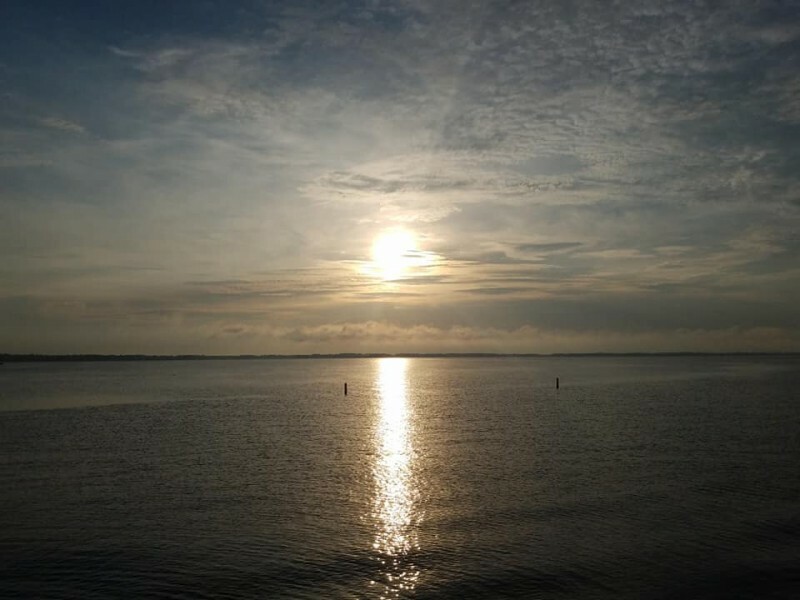 Located off the Albemarle Sound, ½ mile from a small beach. 1 hour drive to the Outer Banks and Kitty Hawk area. 1½ hour drive to Busch Gardens and Water Country USA theme parks. Beautiful little campground, paved sites easy in and out. Right on the water. Down side, can't swim. Some kind of bacteria in the water and swimming not recommended. There were not many instructions or directions when you check in you are kind of left on your own. 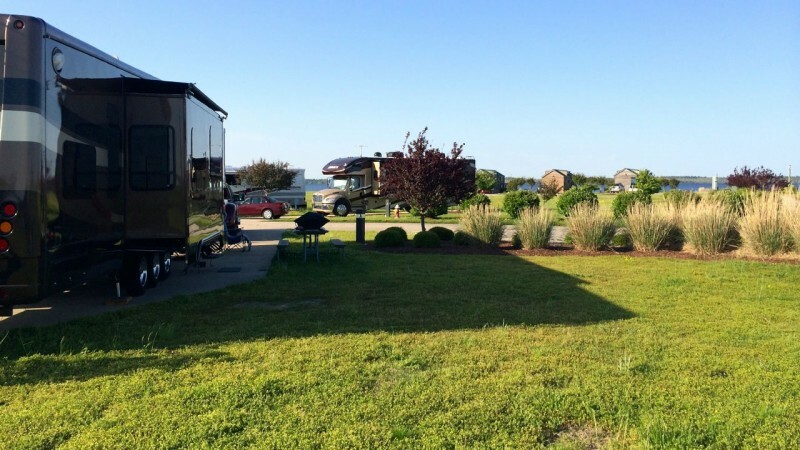 We make sure to check and that there are shower and laundry facilities everywhere we stop as we travel in a 15' travel trailer. When we arrived I did not see laundry or bathrooms and there was no map of the park. I saw that one reviewer said there wasn't any facilities, there actually are. The laundry is in the area where the mobile homes are in a small white building and the bath house is on the other side of the beach (it is your basic beach bathroom, clean but not fancy). Just had to do some exploring to find everything. It was a lovely place to stay and we would stay there again. My dog and I took some beautiful sunrise walks. It would be nice if dogs were not banned from everything. They are cleaner than most people especially when they have their people trained well. A nice location and nice paved sites if you are in A thru J. 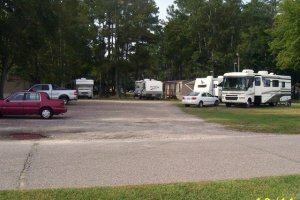 We were assigned site #1 in the small RV location and we moved due to being in a gravel parking lot with cars and surrounded by Mobil homes. There is no bath house or laundry facilities but you do have full hook ups. I would not stay if all they had was # 1 - 4 open. A very small and quiet campground with level concrete back-in sites near the river. No confirmation email is sent after a reservation is made to give instructions for check-in or site assignment. That made arrival confusing because we did not know that we had to check a listing on the kiosk to find out what site was assigned to us and there was no camp host to assist us. Our name was not on the list so we took the only vacant site listed then called the office but got no answer. We finally, after several tries, got an answer and was told that the site we picked was our assigned site but then we found that the spigot was broken and had to move. The one thing that will cause us not to come back is the lack of a bathhouse in the campground. Campers have to use the gym down the street for access to toilets and showers. It was very inconvenient. Wife and I stayed three nights. Very peaceful and quiet . Close enough to Nags Head...but far enough away to avoid the crowds! When you visit don't forget to tour the free Elizabeth City Museum! Will definitely return! Enjoyed our visit at the base. 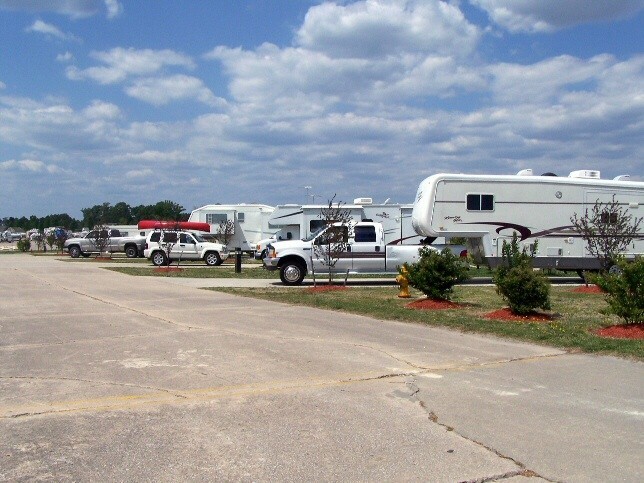 The RV park is small but well kept and the staff that we met were helpful and personable. 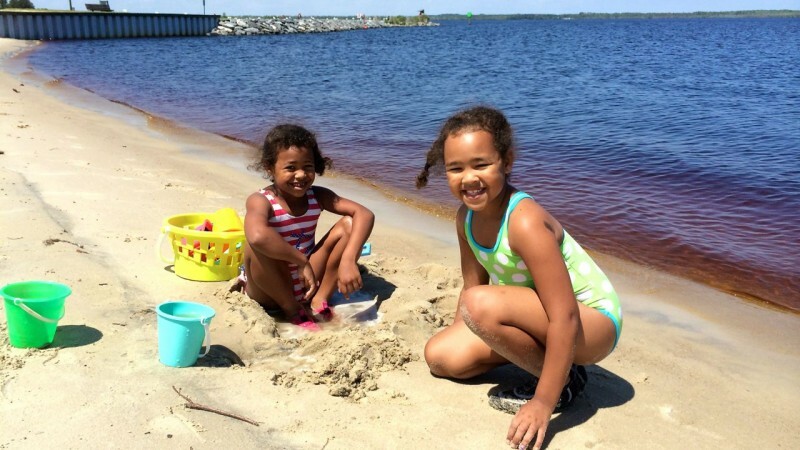 If you are planning a trip to the Outer Banks I highly recommend the base. Nice sites, back in only. Retirees are good to eat at the Chow Hall. There is a gym, a beach, small CG Exchange and mini-mart. C-130s go in and out and do touch and go's, but that's OK. Utilities were there, no wifi or cable though. Nice and quiet spot! This is a beautiful, small park with a river view and a nice, sandy beach within walking distance. Rhonda, the manager, was very friendly and helpful. The sites are concrete, back-in only but the back-in angle makes it pretty easy--even for a big rig. The hook ups were very good and there is a small PX and gym within walking distance. The park is directly beside the airfield, so there is some daytime noise, but it is tolerable. We believe that our television surround sound system may have been picking up some interference from radar equipment, because we had a high-pitch background noise that disappeared once we left the park. 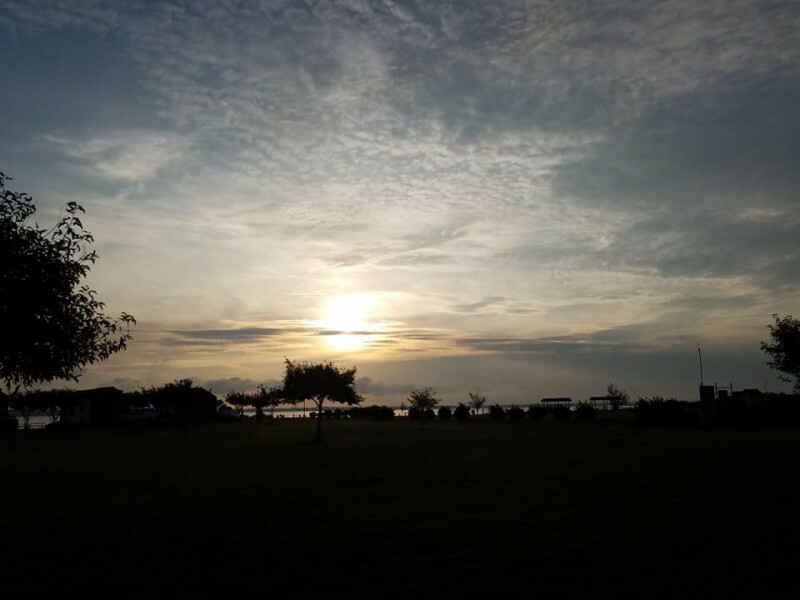 Elizabeth City does not have much to offer to make a long-term stay at the park worthwhile (i.e. a month or more), but our bottom line was: nice park, nice location, good price, and we would definitely visit again. Second stay here. Beautiful location. Small exchange with grocery stores near by. Rhonda is a great manager! This is close to our home base which makes it a great weekend getaway site. Watch for sandspurs in the grass. Good fishing from the pier by the boat ramp. 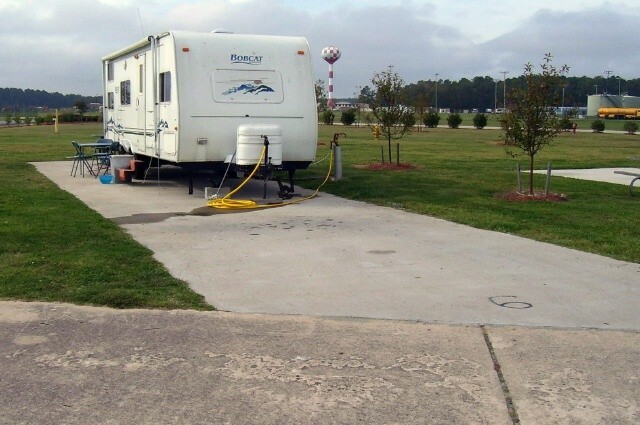 THE CAMPGROUND HAD VERY GOOD UTILITIES, EASY ACCESS CEMENT PADS AND EXCELLENT VIEW OF THE RIVER. WHILE THERE IS NO CABLE TV WE HAD ACCESS TO 7-8 CHANNELS INCLUDING ALL THE MAJOR ONES. WIFI IS AVAILABLE BUT ONLY AT THE MWR OFFICE IN HANGER 7. RONDHA (MWR OFFICE) WAS MOST HELPFUL IN GIVING US INFO. THE OBX WAS ONLY 45 MINUTES AWAY. THERE WAS A SMALL CG BX,CLASS VI AND SHOPETTE WITH GAS STATION. SEVERAL FOOD STORES AND RESTAURANTS WERE WITHIN A SHORT DISTANCE OF THE FACILITY. R.L. left this review using the Directory sofwtare: - Love it here! It didn't look like the old campsites were used any more, they weren't very attractive anyway. The new area is great, large level concrete pads w/ all new hookups, easy in and out. Attractive landscaping. Beach a short walk, very clean and better for swimming than at the ocean. Laundry is functional, located in a small "garden shed" building. Rhonda at MWR was very friendly and helpful. Stayed here 2 weeks. Very quite and relaxing, right by the water. 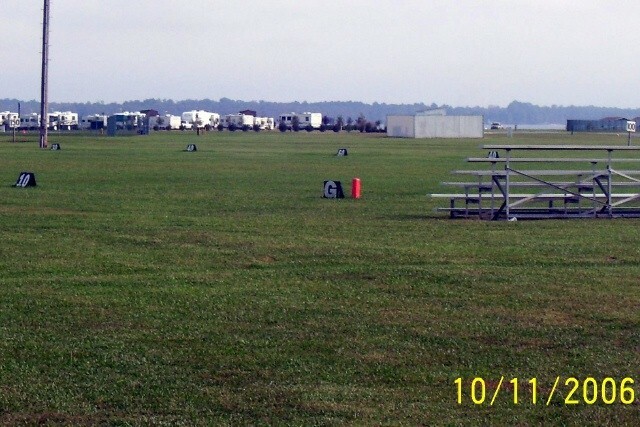 Campground was spotless. Had water, electric, & sewer hookups. Direct TV and Verizon cell & internet worked great. Paid $ 20.00 per night. Small exchange on base, but not far from other shopping and dining out. Had laundry by exchange, $100 wash & $ 1.00 dry. I'm not a numbers rater, either I like a FamCamp or not. Well I like this FamCamp. Will stay here again. R.H. left this review using the Directory software: - Sorry, but I would not bother to go there again. 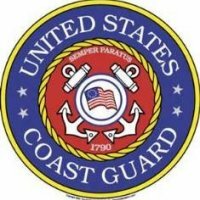 I worked for the Coast Guard in the Control Tower at Coast Guard Air Station Cape Cod. 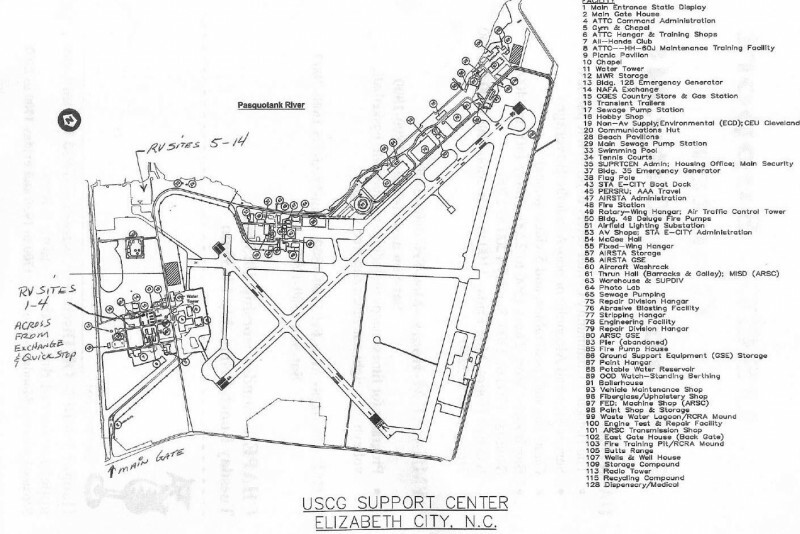 I expected better treatment from the Guard at Elizabeth City. I would have to give them a 1 as a rating. of 1 to 10. Ten being the best. Rhonda in the office was very helpful in getting info for us to visit lighthouses in the area. 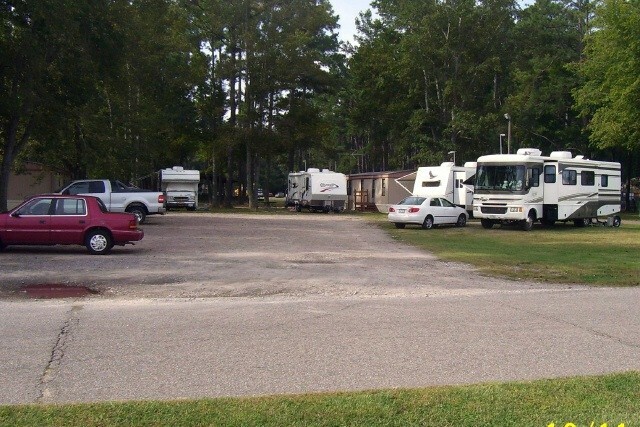 The campground was very clean. New buildings being built, but it was the weekend so it was very quiet. Retirees could eat at the dining facility. We almost didn't get back on base because my husband did not have base motorcycle driving course. So we left earlier than planned. We had planned on riding the Outer Banks, Kitty Hawk, etc, but was told to load our motorcycle back on our toy hauler. 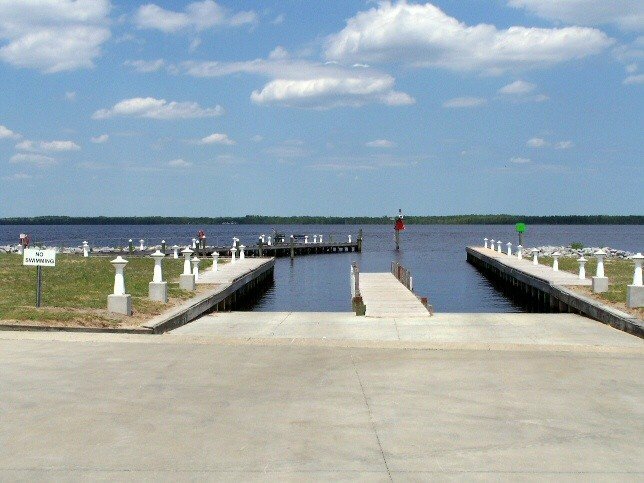 Nice large sites close to river, boat ramp and beach. Easy to find CGS and CG. Would stay here again! Small Base and small park, but relaxing and close enough to the beach that those quirks aren't bothersome. 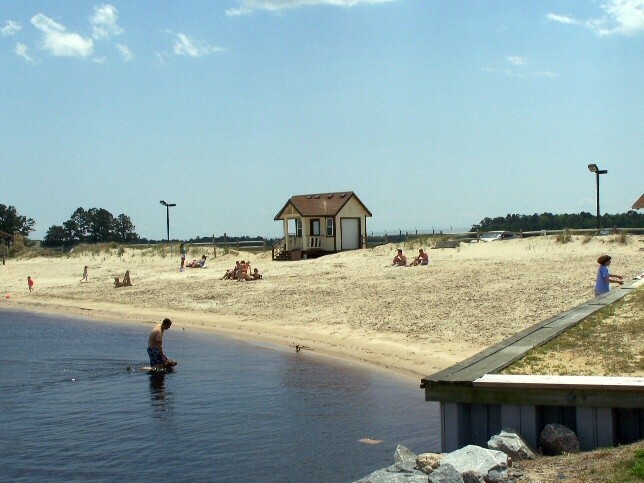 Right on the water with a small beach within walking distance. The big plus is the base is close to the outer banks and Va Beach. No wifi but good hookups. Laundry located near the club and cottages but didn't use it. We were here from May 22-31. Base is small, just a small exchange, gas station. No commissary here but Wal-Mart close by. Relaxing stay would recommend it and would stay here again. We hadn't been here in about 4 years, but needing a place to rest and relax, basically, just to chill, we decided to visit. Easy reservations for our 3 night stay.....Most campers look like they are finishing up "wintering" here as there wasn't much movement of folks moving in or out......Didn't use the laundry this time, but have been told it's still in the same place. We do have a negative to report though....As pet owners we are always observant of campground/RV Park rules pertaining to leash and clean-up rules, hence, our pet is always on leash and we clean up after him every time. While walking our dog, we saw quite a few "doggy gifts" left for someone to step in (there is a bag station in the park, but is empty.) Also, observed a couple small dogs allowed to run "free" without a leash...good thing the owner had some voice control over them and our dog was on short leash or it could have been ugly. We did not report this because the office is closed on the weekend, so had no recourse other than going the other direction when walking our dog...I do know that the staff reads this so hopefully the issue will be addressed. The new CG Exchange is very nice....with the new gas pumps projected to be completed within the next few weeks.....Hanger 7 and the whole MWR Staff are friendly and helpful. John Welcome, Manager, can be proud. As other have commented the sites in the new section are very nice and well maintained. The (2) stars for facilities are due to no showers and PX/NEX. The new exchange opening in Nov will increase it to (3) stars, but the showers need to be built. 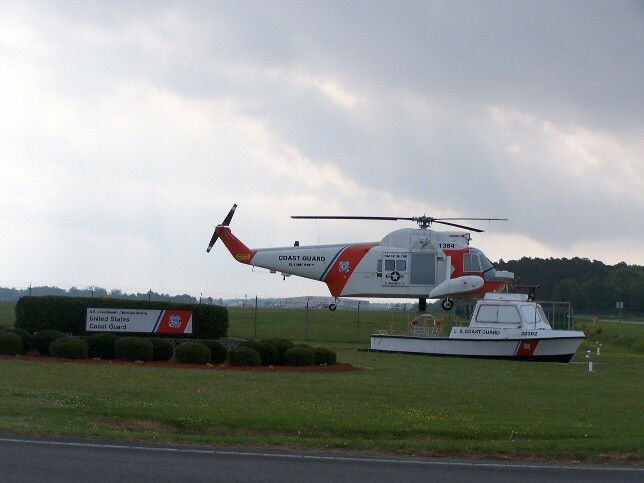 It is a small Coast Guard sea/air rescue base so I don't expect them to be built. You can shower at the gym. No cable/wifi. Nice waterfront seafood restaurants in town. Very pretty views of the tidal basin inlets from the campground. 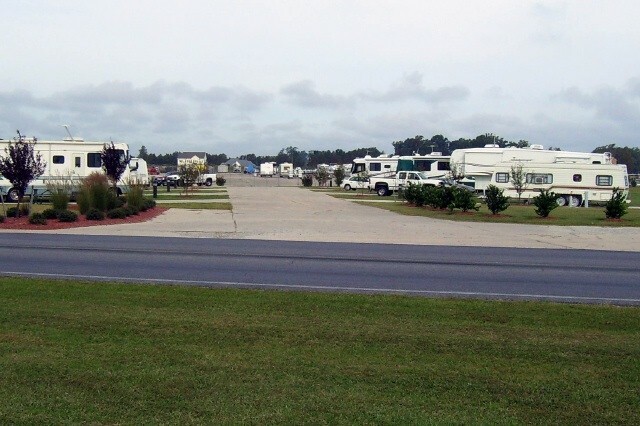 A pretty base and RV park(new section). PS: Watch out for bee nests in the grass. Call RV manager and they will get maintenance out there to spray.